Built in the wake of the 1846 Great Fire, the structure now known as the Thompson Building is one of the oldest mercantile buildings still remaining in downtown St. John's. It is located at 303-305 Water Street. The Thompson Building is typical of 19th century commercial construction. The building was finished in 1847, the year after the Great Fire of 1846 that destroyed or damaged virtually every merchant house in St. John's. The three-storeyed structure was built with the possibility of fire in mind. Rather than being made exclusively of wood, the builder, probably the merchant Richard O'Dwyer, opted for a brick exterior. This exterior helped save the building from serious damage decades later when the city's last Great Fire destroyed most of the city in 1892. The building is a typical nineteenth-century commercial building. It has a timber frame and its original exterior was made of brick. The interior of the building has been renovated numerous times over the years. The building remains in solid shape mainly because of renovations made in 1970 and 1988. 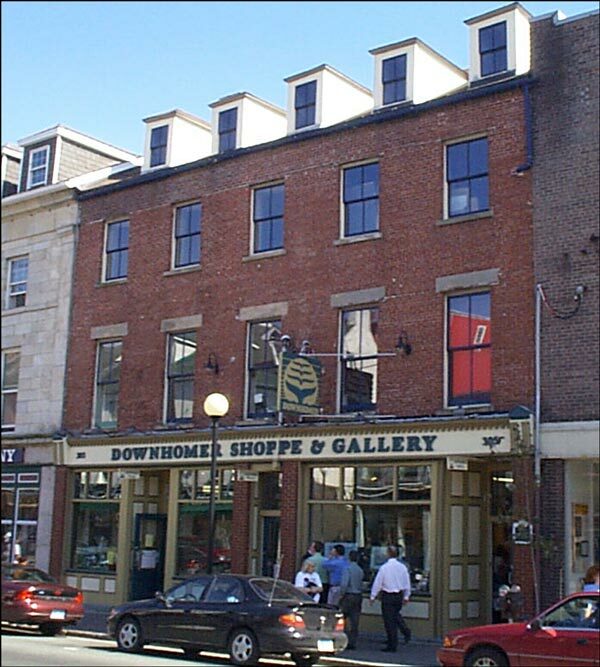 The Thompson building was recognised as a Registered Heritage Structure in May 1989 and "The Downhomer" was presented with a commemorative plaque by the Heritage Foundation of Newfoundland and Labrador on Heritage Day, 1998. This structure was also awarded the Southcott Award for heritage restoration by the Newfoundland Historic Trust. Also view the Thompson Building Registered Heritage Structure on the Heritage Foundation of Newfoundland and Labrador web site. The Newfoundland and Labrador Heritage Web Site has on its site only a portion of the registered heritage structures in Newfoundland and Labrador. To view a complete list or search for a particular structure visit the Heritage Foundation's Property Search page.